LSBU – which has a strong focus on applied research that addresses real world challenges – emerged as one of the top three modern universities in London after 73% of its research was given either the highest 4* or 3* ranking for 'impact' – an assessment of the reach and significance a research project has achieved. The Research Excellence Framework (REF) reviews the quality and impact of UK higher education institutions' research and takes place only every six years. The focus on impact is a new addition to the evaluation criteria in 2014. Since the previous exercise in 2008, LSBU has improved its overall average rating – also known as the Grade Point Average (GPA) - by 12.5%. The university's scores for impact were particularly strong in the areas of Sports & Exercise (90% of LSBU REF entries achieved a 4* or 3* grade); General Engineering (80% rated 4* or 3*) and Allied Health Professions, Dentistry, Nursing and Pharmacy (80% rated 4* or 3*). LSBU also improved the total number of its full-time equivalent staff carrying out research that were submitted for inclusion in the assessment by more than 17% since 2008. The four UK higher education funding bodies allocate about £2 billion per year of research funding to UK universities based on the quality and volume of each university's research. 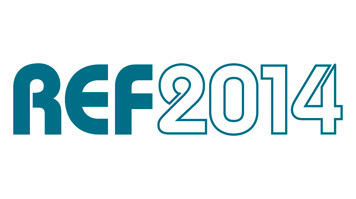 The REF 2014 and its predecessor the Research Assessment Exercise (RAE) assessed research submitted by UK universities across all disciplines to inform those funding allocations, and provide accountability for public investment in research while demonstrating its benefits. LSBU Vice-Chancellor Professor David Phoenix said following the REF announcement: "London South Bank University takes great pride in our research as it is addressing the challenging issues faced by society today and providing applied solutions to the business world and beyond. The fact that many of the organisations for whom we have carried out research return to us time and time again is further demonstration of our impact, as they know LSBU can be relied upon to overcome the challenges put before us. It is pleasing to see that the majority of our research impact was seen to be of the highest standard." Tate Britain partnered with LSBU and the University of the Arts, London, in 2007 for an extended research project into the ways in which the Tate understands its audiences and the challenges of contemporary cultural diversity. London Underground Ltd turned to LSBU to find a cost-effective solution to cool underground tube stations. Actegy collaborated with LSBU on a study to investigate discomfort associated with poor circulation and the benefits of potentially life-changing technology. "Our partnership with the SESRC at LSBU provided the expert evidence and confidence we needed. Actegy, with LSBU's research, has dramatically impacted on the lives of one million people at risk of, or already diagnosed with, peripheral circulation problems. The research collaboration with LSBU is already improving lives." Roseanna Penny, Director of Actegy.